We all know one fish and one fish make two fish, but recent evidence suggests that fish may know that too. In fact, mosquitofish can count up to four, according to results from a team of researchers led by Angelo Bisazza of the University of Padua in Italy. 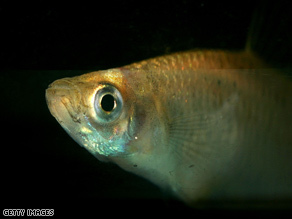 In each test, a lone female mosquitofish had two options for shoals to join, each containing between two and eight other fish. The results showed the lone fish would usually choose the shoal that was larger by just one fish, consistently picking the shoal of four fish over the one with three, and the shoal of three fish over the one with two. But when one of the choices was larger than four fish, the fish could no longer discriminate. Monkeys and one-year-old children exhibit the same limit, Bisazza said. Experiments examining what the fish would do when confronted with larger numbers found that, for shoals of more than four fish, they could still tell the difference between the quantities if there was at least a 2:1 ratio. That is, they would choose a shoal of eight fish over the one with four, but they could not discriminate between a shoal of 12 and a shoal of eight. These results are consistent with mathematical abilities observed in birds and mammals. Similar performance has also been observed in people who speak languages that contain limited vocabularies for numbers, Bisazza said. For instance, speakers of the Amazonian language Munduruku only have words for numbers from one to five, and do not have names for numbers beyond that. Though they are able to solve nonverbal number tasks involving quantities up to 70, in exact arithmetic they do not do well with numbers larger than four or five, he said. Besides fish, other non-human creatures that have shown at least some rudimentary mathematical abilities in studies include chimpanzees, macaques, dolphins, dogs, parrots and pigeons. "Many researchers are now convinced that mammals and birds may share common mechanisms to count objects and compare quantities," Bisazza said. Wow, it is amazing that fish actually know that, science can really tell us some facts. GREEN ENLIGHTENMENT: "EVEN FISH COUNT". LOVE OUR EARTH. someone had to place last in the graduating class! How do the researchers know that the fish are comparing numbers rather than geographical or spatial area of the group, i.e., that they aren't just entering the larger school for the sake of safety? One more reason to be VEGAN. Regarding your first question: how do scientists know that they aren't comparing spatially relative sizing? Scientists would claim that they must be, considering that they can tell a group of 8 is twice as large as a group of 4. They are using the fact that the fish are able to discriminate between a group of 3 or 4 as being able to tell the difference of a 33% gain in size. This would generally lead to a hypothesis that they are able to enumerate the set of fish in each grouping. As for the choice based on safety: Who cares what the motive is? Motive does not affect ability to distinguish numerical value. As a matter of fact, the very fact that you mention one group being larger than the other presupposes the fish are able to utilize some metric with which they can evaluate the size of the group of fish. You can't assume something you are trying to prove. It's bad math and bad science. How much of my tax money was spent on this crappy study?? "How much of my tax money was spent on this crappy study??" One man's crap is another man's fertilizer. Лучший фильм на твой взгляд ! Магазин обуви: каталог женской обуви украина Liska (Лиска), обувь 34 35 размера женская Liska (Лиска), уги обувь женские Liska (Лиска), обувь больших размеров женская спб Liska (Лиска), nike обувь женская Liska (Лиска).